For the past four years, a third of the area’s primary care practices partnered with Finger Lakes Health Systems agency to achieve better patient outcomes and save costs. The $26.6 million program used teamwork, care management and electronic clinical data to drive improvement. Preliminary results are in and show that patients who worked with care managers did better at managing such chronic diseases as high blood pressure and diabetes. Impressively, their hospital admissions dropped more than 50 percent. Click here to learn more and see a video of transformation in action. What skills and competencies does the health care workforce need to provide a coordinated experience for the patient and family in a fast-transforming health care landscape? That is one of the questions posed by a workforce consortium co-convened by FLHSA and Finger Lakes Regional Economic Development Council that is looking into the needs of the local health care workforce. The Regional Consortium on Health Care Workforce recently recommended prioritizing partnering with patients and families in care, working in teams within and across organizations, and gaining skills to use health care technologies such as electronic medical records more efficiently. Read more. Pictured above: Earlier this year, members of the senior care advisory team for the Regional Consortium on Health Care Workforce brainstormed ways to address workforce shortages. Partners working to improve care transitions marked five years of success last month. The Care Transitions Intervention involving Lifespan, Lifetime Care, UR Medicine Home Care, area hospitals and FLHSA grew from the 2020 Commission's goal to reduce preventable hospitalizations. The intervention uses health records, family coaching, medication reconciliation and other outreach to improve the move from one care location to the next. “By working together, our partners have done a wonderful job helping people avoid unnecessary hospitalization,” said Melissa Wendland, FLHSA’s director of strategic initiatives. “This initiative reduced the risk of 30-day readmissions by 29 percent.” Read more. Pictured above: At center, Adola DeWolf, care transition supervisor for Lifetime Care, speaks during the five-year celebration of the Care Transitions Intervention. With DeWolf are Lisa Wilson, at left, care transitions coordinator at UR Medicine, and Ann Marie Cook, president and CEO of Lifespan. 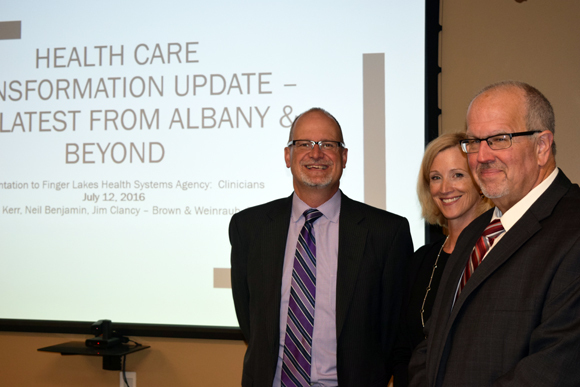 The quickened pace of change in health care is not expected to let up anytime soon, Albany consultants told clinicians and leaders from community based organizations on July 12. The state continues to roll out initiatives aimed at improving care, providing opportunities for providers and patients, but also creating a plethora of new clinical challenges. Read more. Play ROCs Your Neighborhood, which takes place at 12 sites July 16 in the City of Rochester. View times and locations here. “Walk In My Shoes” Rural Poverty Simulation, which will take place from 10 a.m. to 1 p.m. July 20 at the Genesee River Restaurant, 134 North Main St., Mt. Morris. Register online.